Many people complain of indigestion. But what exactly does it mean? Well, indigestion in simple terms means a lack of proper digestion but most people have a different explanation. Some people describe it as a feeling of fullness and some as bloating or discomfort in the abdomen. So what exactly is indigestion? In this article, we will explain about indigestion and the common causes of indigestion that everyone needs to know. Indigestion can also cause excessive bloating or belching, nausea and even vomiting. Heal Your Gut And Heal Yourself..!! 1mg Exclusively Brings Best Selling Products For Bad Stomach. Grab It Now..!! Poor eating habits: In some cases, indigestion can be caused due to overeating or eating too fast. Also, eating too much spicy, sour and oily foods can cause abdominal discomfort. Moreover, going to bed immediately after meals can make it difficult to digest. Smoking: Numerous studies have reported the association between cigarette smoking and alcohol consumption with indigestion. Cigarette smoking increases the frequency of gastroesophageal reflux episodes by reducing the pressure on the esophageal sphincter and salivary secretion of bicarbonates, which help in digestion. Tobacco Threatens..!! Say No To Tobacco Now. How? Let Us Help. Click Here. Certain medications: Certain medications such as paracetamol and aspirin are known to increase the risk of indigestion. It is also reported that use of common painkillers such as non-steroidal anti-inflammatory drugs (NSAIDs) can cause indigestion and other digestive problems. GERD (Gastroesophageal reflux disease): It is a condition that causes a burning sensation (heartburn). However, in around 60% of people with GERD, heartburn along with epigastric (upper central region of the abdomen) pain or discomfort which radiates towards the throat is reported, which indicates indigestion. Peptic ulcers: Most people with peptic ulcers show symptoms of indigestion such as postprandial epigastric pain or night pain. It is a condition which is characterized by sores in the lining of the stomach which can even be caused by Helicobacter pylori bacteria. Gallstones: This condition can cause unexplained dyspepsia which leads to pain or discomfort in the upper abdominal region. It is different from that seen in biliary colic, a condition that causes severe, episodic and constant epigastric pain which usually lasts for several hours. Gastric cancer: It is the fear of cancer due to which many people with dyspepsia consult a doctor. Around 60-90% of patients with gastric cancer present with dyspepsia. Functional dyspepsia: In some cases, there is no known cause of indigestion. This condition is termed as functional dyspepsia. It could be due to abnormal muscle motility in the stomach where food is digested and moved to the small intestine. Indigestion: When To Go To A doctor? Indigestion is a common problem which should not be ignored. You should consult a doctor if you suffer from chronic indigestion or if you fail to manage the condition at home through home remedies or over the counter medication. This is because, if left untreated, it can lead to worsening of the symptoms and may even interfere with your quality of life. 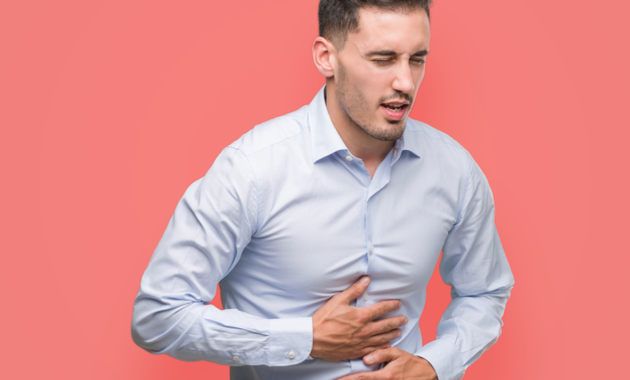 You should see a doctor immediately if you experience symptoms such as severe vomiting, bloody vomit, black stools, or trouble swallowing along with indigestion. Talley NJ, Zinsmeister AR, Schleck CD, Melton LJ 3rd. Smoking, alcohol, and analgesics in dyspepsia and among dyspepsia subgroups: lack of an association in a community. Gut. 1994 May;35(5):619-24. Talley NJ, Phung N, Kalantar JS. ABC of the upper gastrointestingal tract: Indigestion: When is it functional?. BMJ. 2001;323(7324):1294-7. Indigestion (Dyspepsia). Digestive Diseases. According to the National Institute of Diabetes and Digestive and Kidney Diseases. ← Causes of Smelly Feet and Tips To Get Rid Of It!